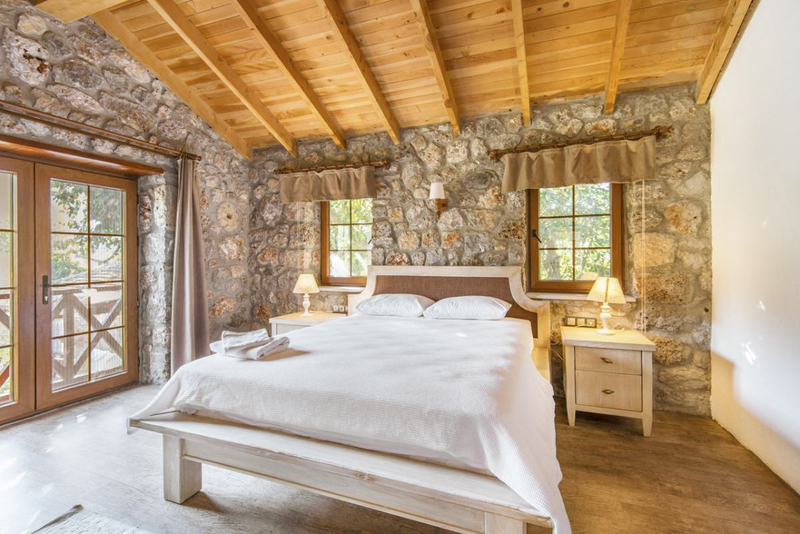 If five-bedroom Villa Eskibache were a romance, it would probably be the love-at-first-sight kind. 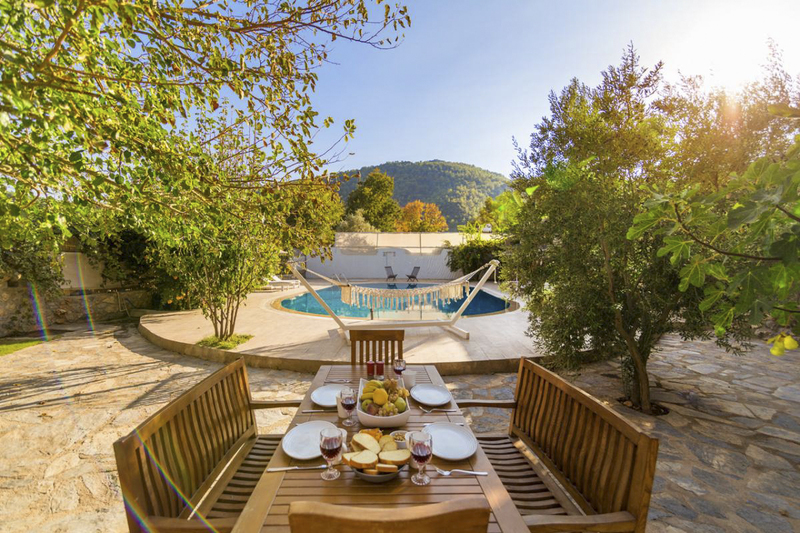 The beautiful villa is nestled in the tranquil Kayaköy countryside and is surrounded by lush greenery and a large secluded garden. 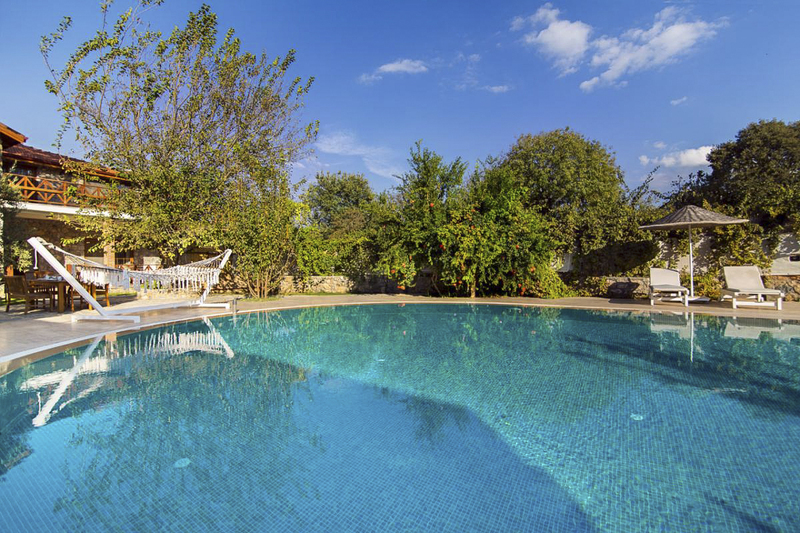 With luxurious interiors, a spacious private outdoor swimming pool and endless uninterrupted views of the rural landscape, you’ll be forgiven for never wanting to leave. 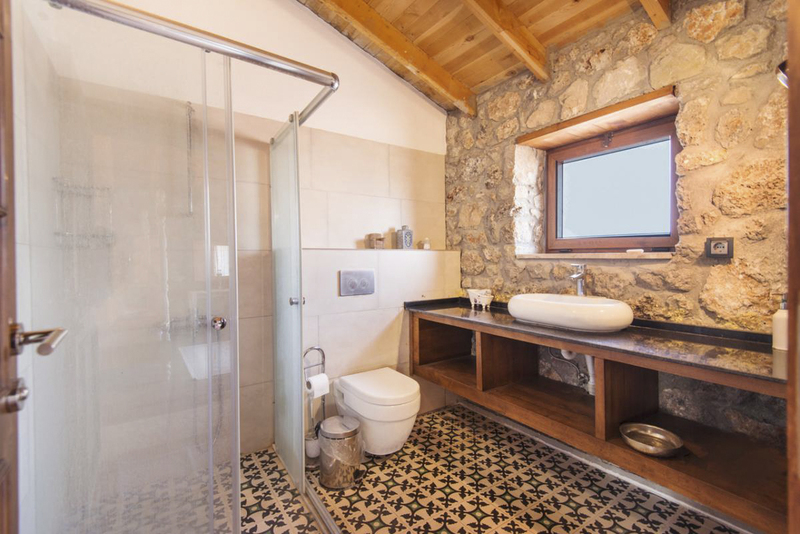 This charming Turkish villa draws on its earthy surroundings with rustic stone walls and natural-coloured furnishings. 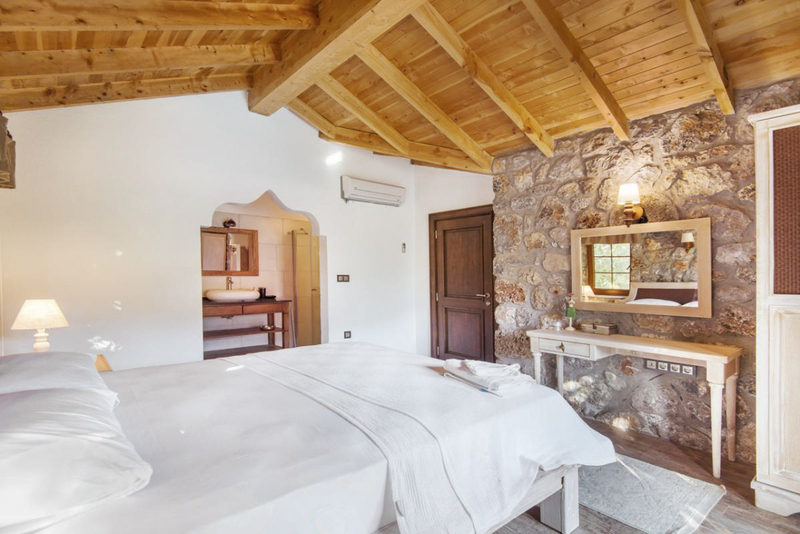 The interior is home to an elegant mix of stone and wood and has floor-to-ceiling windows and doors letting in the beautiful Mediterranean light. It isn’t just the setting and design which are on point here either. 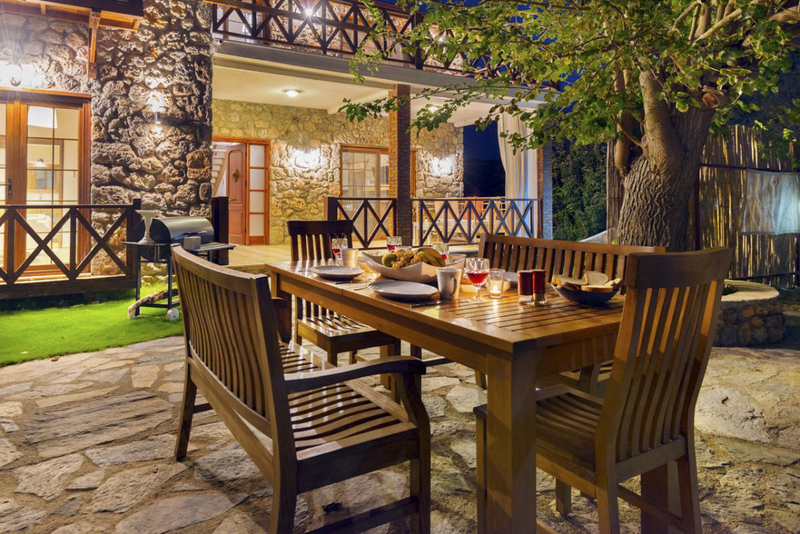 The villa has everything you could want for a comfortable group-holiday stay, from a modern fully-equipped kitchen to a ten-seater dining table. 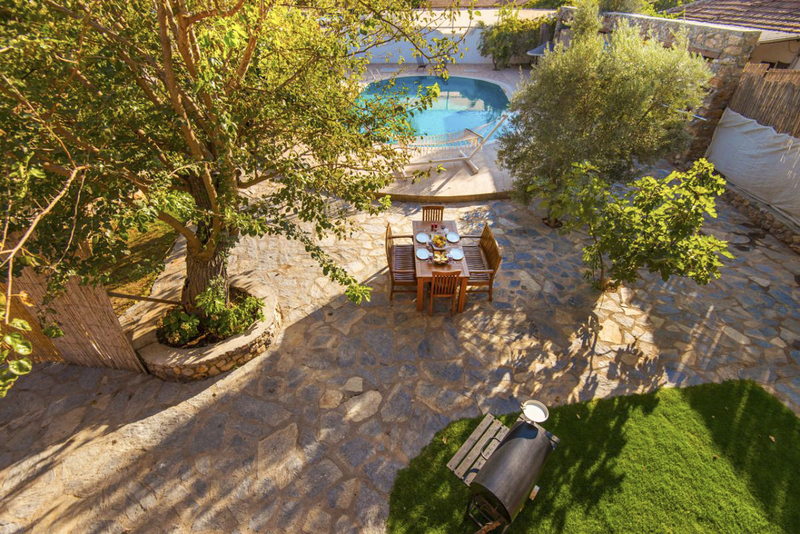 Outside, the private garden with oval-shaped pool is dotted with several loungers – perfect for finding your favourite spot in the sun or the shade – and there’s an undercover terrace for al fresco dining while soaking up the peaceful ambience. 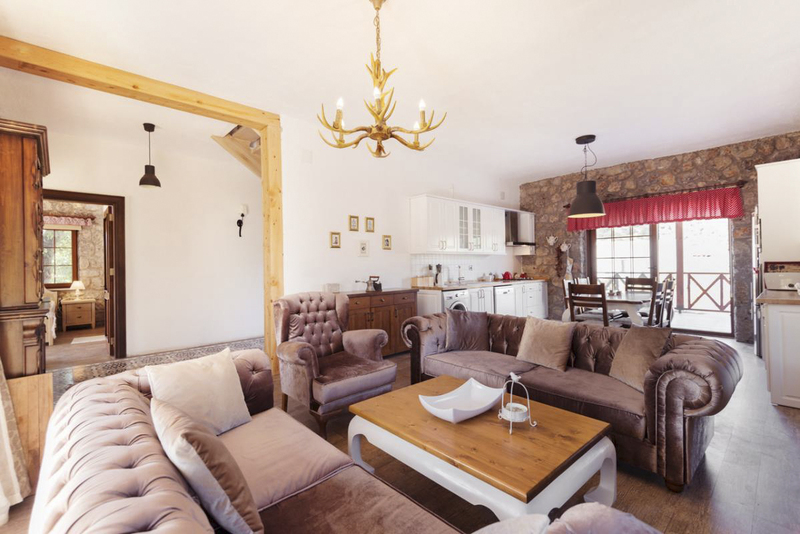 Walk through the double doors, and you’ll be in the stylish living room equipped with a television and comfortable sofas for chilled evenings indoors. 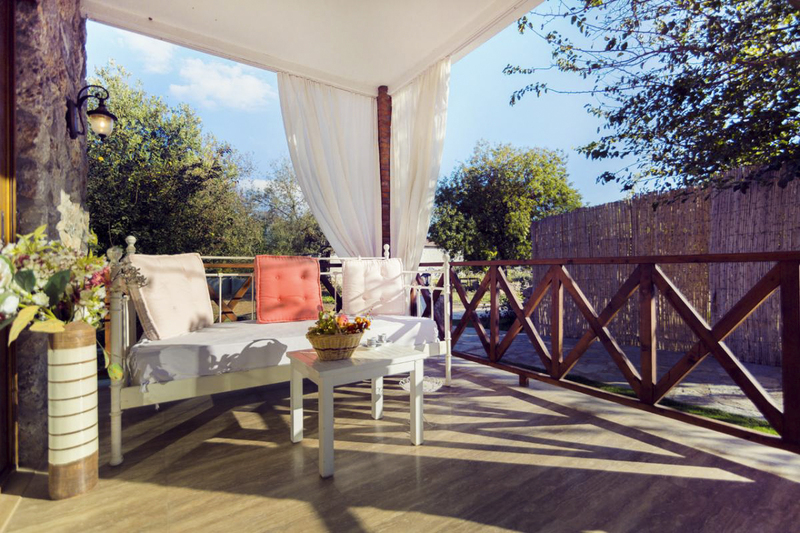 There are three inviting double bedrooms and two twin rooms for you to choose from. They’re all equally stylish and serene with plenty of space for storing your holiday belongings and thoughtful touches like vanity desks. 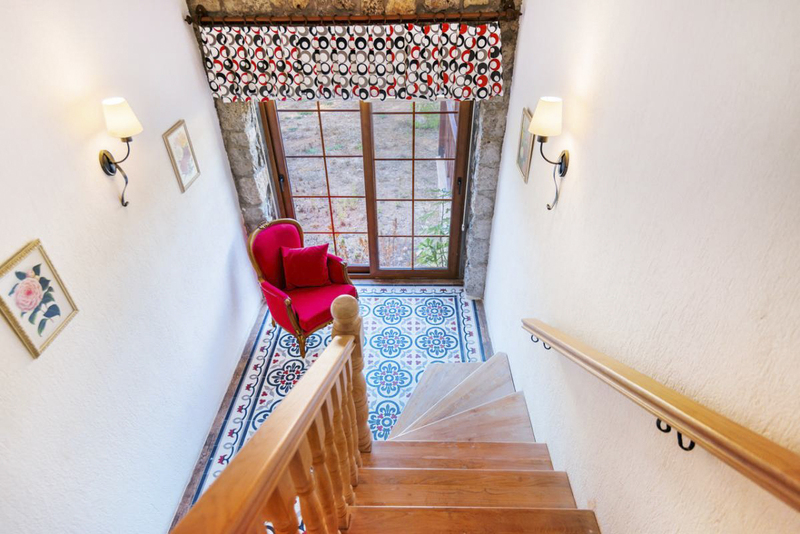 The double bedrooms have access to the balcony, making the most of the majestic vistas, and there are five bathrooms across the villa with intricately patterned tiled floors. 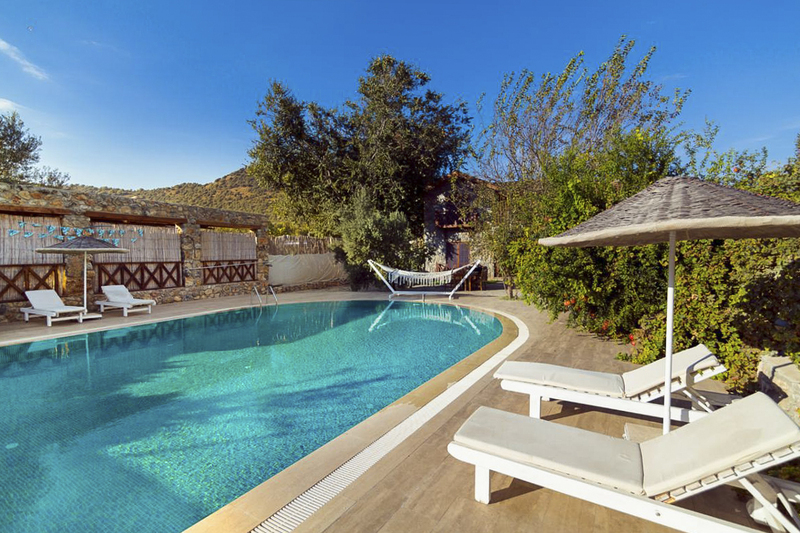 Whether you’re looking for pure relaxation in a peaceful setting or an idyllic base to explore the coastline and rich cultural heritage of Turkey, Villa Eskibache has you covered. 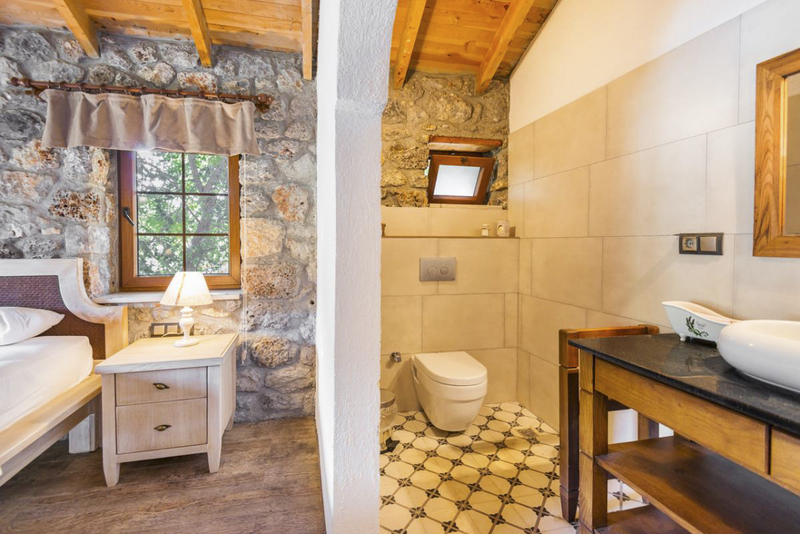 It’s only a 300-metre walk to the nearest bus stop where you can catch the Dolmus to historic Kayaköy centre or the lively towns of Fethiye, Ölüdeniz and Hisaronu. The nearest beach is a short drive away for taking a cooling dip in the sapphire blue sea or lazing with your favourite book. 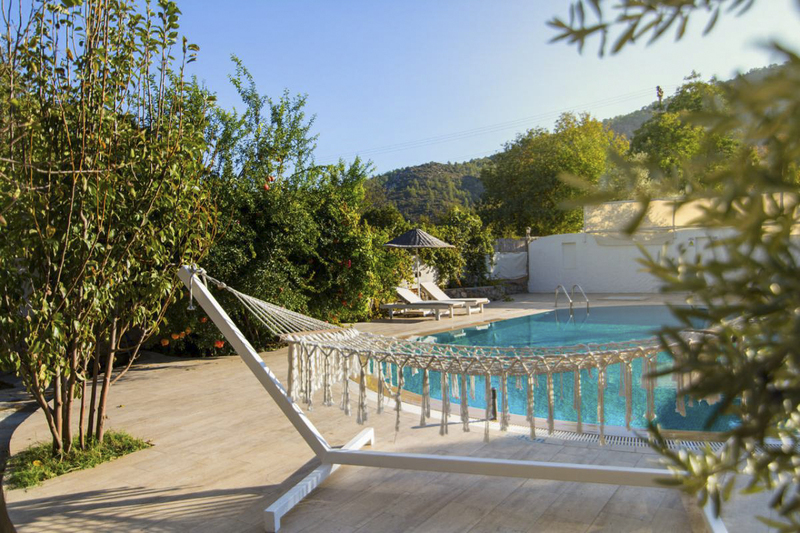 Villa Eskibache is in peaceful Kayaköy village, 8km south of Fethiye in southwestern Turkey. 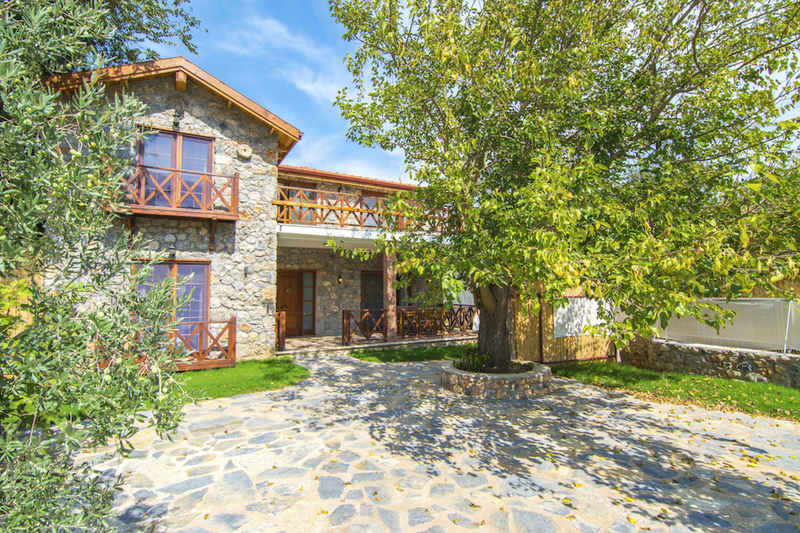 The village is the perfect place to walk (1km to centre) and explore, with a majestic pine tree-lined landscape and the dramatic views of the deserted Greek village, Levissi. 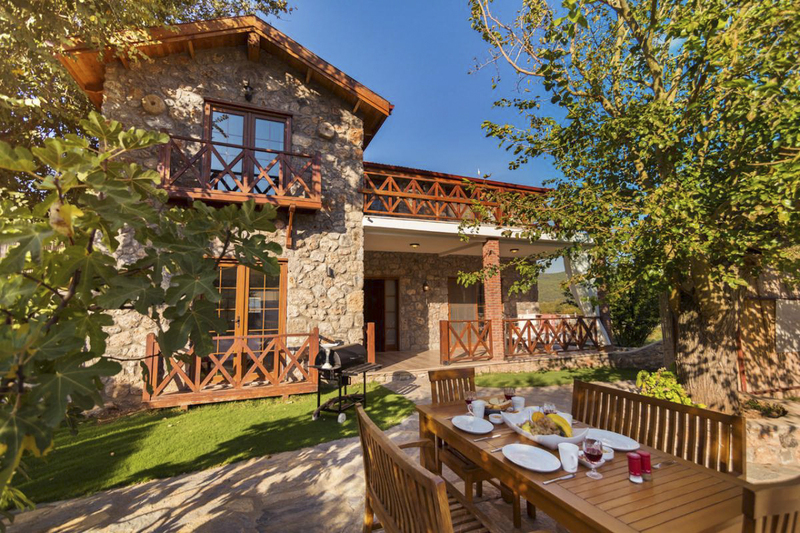 There are traditional cafes to stop for lunch and drinks and a couple of BBQ restaurants, where you can sit at classic Turkish tables and sample different mezes or the Turkish Gozleme, pancakes. Visit the old houses and chapels and high-on-the-hill monastery of Afkule in the ghost village with spectacular views. The nearest beach is Soguksu Cove. It’s possible to hike to this natural swimming spot from the abandoned village of Kayaköy, following the Lycian Way Trail, a series of marked tracks that leads from the south of the village.. The cove has a small pebbly beach, and there’s a restaurant there offering a house speciality of wild boar stew. For the less adventurous he secluded bay of Gemiler is a short drive away. It’s a lovely place to swim, snorkel or relax. Facing the bay is Gemiler Island, which is well worth visiting for its archaeological ruins. You can take a boat trip there from Soguksu Cove. From Kayaköy, you can easily explore more of the surrounds. 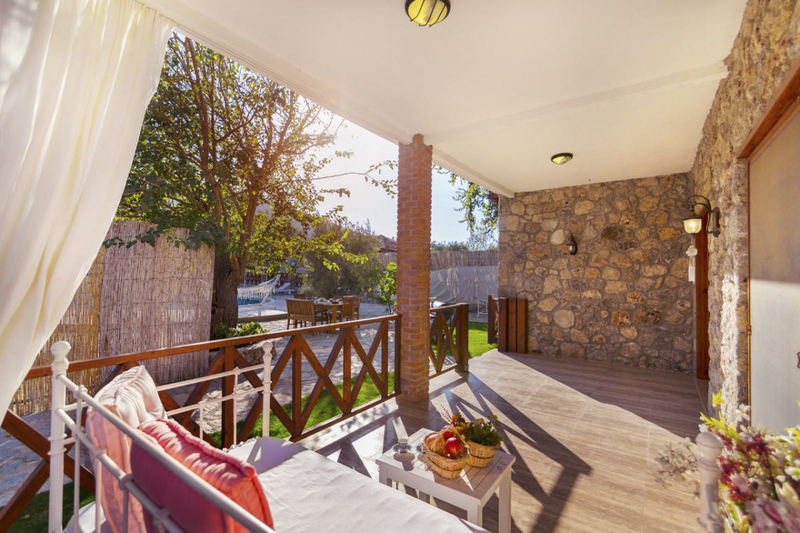 There’s a Dolmus (local bus) stopping just 300 metres from outside the villa, and it goes to the lively towns of Fethiye, Ölüdeniz and Hisaronu. Fethiye is known for its scenic natural harbour, blue waters and numerous rock tombs including the 4th-century B.C. Tomb of Amyntas, carved into a bluff and overlooking the city. There are shops and markets in the city for picking up everything from homemade rugs to fresh produce. 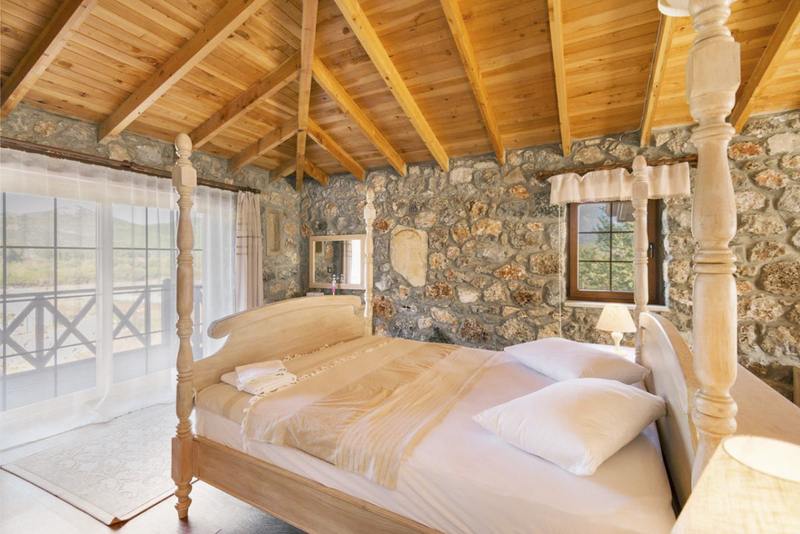 For more outdoor adventuring, you could visit Butterfly Valley which is home to a myriad of beautiful butterflies, the ancient ruined Lycian hilltop citadel Tlos or Saklikent Gorge, a dramatic natural feature just outside of Fethiye. In Ölüdeniz, 15km south of Fethiye, there’s a nature reserve with a calm lagoon and curved beach, popular for paragliding, swimming and scuba diving.